In One Weekend I Was Drained! The day after the desert, we woke up in time for a 7:00am breakfast and an 8:00am departure to Wadi Bani Awf. 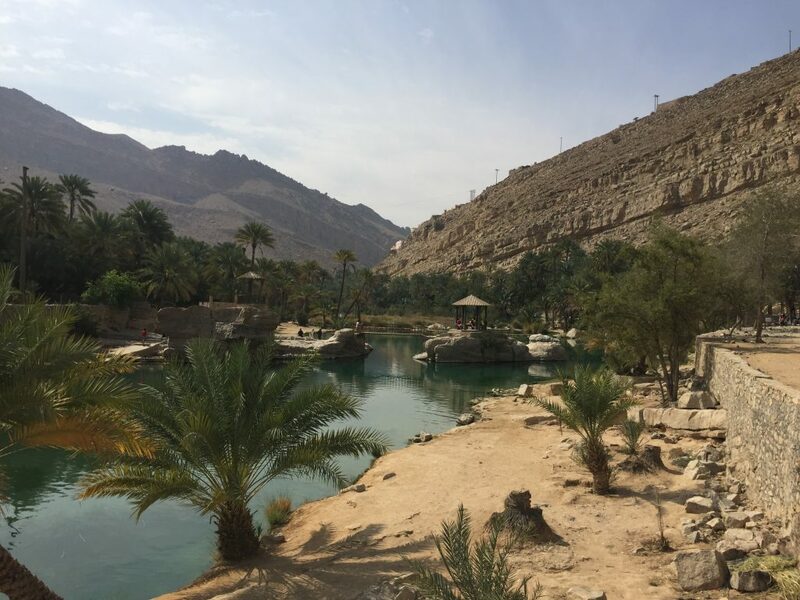 A wadi is a valley or channel that is dry until the rainy season, and when it is full of water is a perfect swimming hole for relief from the heat. 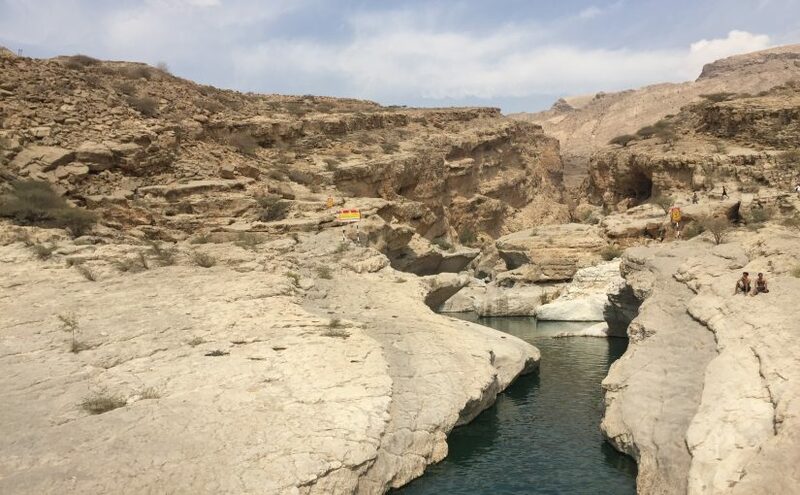 This wadi was in the middle of a collection of mountains that used to be seafloor just like those in Ibri. We had to travel through the rock before finding the little haven. Then, we followed an old falaj* until we found its source of water. I smiled seeing that because it reminded me how faithful many people in this country are and how Muslims too share the care for nature just as Christians do. Once I was lathered heavily with sunscreen, I got a spark of confidence and slid right into the blue. Beautiful. It felt beautiful. I paddled about, absorbing every touch of fish nibbling my toes (free pedicure! ), every splash and every polished rock. The water lead through tunnels and walls of rock and I found myself wedged between dry, harsh boulders but yet still there was a lush, living stream. After a while, I carefully pulled myself up and out of the water onto a slippery rock. I needed sun, so I headed up the wall by intentionally placing my toes in holes narrowed by years of water erosion. My wet clothes turned sticky, but I continued in my bare feet until I reached the top of the mountain. Across the cavern on the other side of the wadi, an Omani family sat down for a picnic while little girls pranced about in their traditional, colorful dresses. I watch for a while, then climbed back down for lunch. With about 45 minutes left, my friend David and I realized we had not seen the cave at the end of the wadi. So, we set off on a mission to find it before we had to pack up the bus. We followed a trail through pebble bottom creeks, under and through sweating boulders, and barely stayed on our feet—I won’t tell you who took the first tumble, but it wasn’t me. When we found the steps to the cave, David borrowed a phone for a flashlight from some Omani boys next to the entrance and we headed in. We crawled through damp, muddy gaps and I scrapped my knees and knuckles. I could feel my hair matted on my forehead and under my hat. My cheeks were red and sweaty and puffy. But we kept going and found a pool of water in the bottom of the cave. In the process of one hour, we had gone to the highest point of the wadi and perhaps the lowest. We rushed back to the restaurant and made it just in time for me to change before heading to another city. In the bathroom after changing back into my dry clothes, I caught myself in the mirror and laughed at my beet cheeks and crunchy hay-looking hair. I was a mess, but my wild green eyes were joyful. Little places like the wadi show light in the midst of darkness. Life, where there seemed to be only dead, dry things. Coming into contact with the Lord in this way fills my heart and was an important reminder before heading back to school the next day.